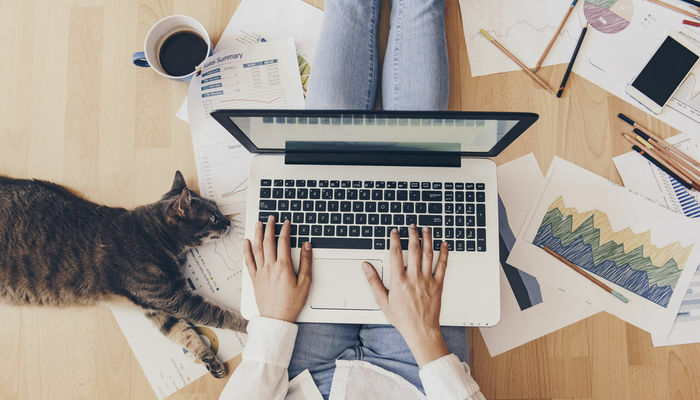 If you enjoy working from home and are taking advantage of the developments of the information and communication technology, including the cloud apps and sharing facilities, you will have to focus on improving your productivity and reducing the stress that comes with sharing your business and home environment. You’ll need to up your game when it comes to looking professional, managing your time, getting organized, and creating content and documents. Below you will find a few tips on how to prevent working from home taking its toll on your work-life balance. One of the mistakes people make when they are starting their own business from home is that they forget to switch off. They spend every waking hour in front of the computer, or chasing leads on the telephone, and don’t find time to do something they really enjoy. If you don’t reward yourself for your hard work as a business owner, you will eventually burn out and lose interest in the venture. Set your working hours, and learn when to switch off the computer. Every now and then, you will have to take a break. Plan something tun in the weekend, go for a walk after lunch, or meet your friends in a coffee shop. Just because you are running a business from home, you are not tied to your office chair and computer. You need to clear your head and get a new perspective on the task ahead, and this means walking away. You might also schedule vacations to take a break from technology and step away from your business to see it in a different light when you return. It is important that you are not a prisoner of your business. You must get out of the house, even if you are only taking the dog for a walk or picking up some milk from the local shop. Make sure that you don’t spend all day in, finding silly excuses like waiting for the postman to turn up, or making sure that the cats are OK. Cats can look after themselves, and you should, too. Go on a shopping trip in the middle of the day and take advantage of the fact that other people are at work. It is crucial that you keep your workspace secure and safe. Once people find out that you are running a business from home, you will have to expect unwanted visitors, especially if your office or workshop is set up in an outbuilding. Protect your business future and make sure that you have an advanced alarm system and security features installed. You can’t work from the corner of the sofa or a desk in the bedroom or living room. You need to adopt a mindset that helps you distinguish between work and family life. You need a door you can open and close on your office, and a way to eliminate distractions. This way you can improve your productivity when working from home and make the most out of your free time. It might also be a good idea to take advantage of various productivity tools to improve your performance and finish projects faster. From simple tools, such as Pomodoro to more advanced planners, there are plenty of apps and software available for people who have no boss and would like to stay focused and motivated all day. In case you run a business from home and work remotely for clients, you will have to invest in collaboration tools. Google Drive and other cloud based solutions will help you share and edit documents and send different updates. You can also organize your work, so you don’t have to call people unless you absolutely want to. Keeping in touch with your clients is a good way of letting them know that you pay attention and listen to their needs. You might think that you will have to meet every client in person to make sure that you get paid on time. However, you can take care of all your invoicing online and even manage your accounts, so the system automatically sends out payment reminders. You can get an online or physical terminal and start taking payments on the phone, or invest in advanced solutions, such as shopping cart software. You might use Google Payments, Stripe, or simply PayPal to start accepting cards on your website. As a business owner, you need to make sure that you backup all your files and keep your records for up to seven years. If you don’t want to buy a new printer cartridge every week, you can use cloud computing, and send out contracts using online document solutions. You can even get a mobile email signature set up, so you don’t have to worry about the enforceability of your client contracts. You can file all your documents and create safe copies in case the taxman wants to see them. Marketing your business can be one of the most daunting tasks, and – if you are not careful – you might end up being stuck on social media and writing your blog for hours each day. If you create a professional custom marketing funnel for your business from the beginning, you can take the guesswork out of your promotions and figure out slowly what works and what doesn’t. Improve your conversions and get better results from your marketing results every day by monitoring your website traffic and results. Running your business from home is not without challenges. Make sure that you are able to focus on the work ahead and keep engaged with your clients and target market. Automate what you can, separate work life from home, and reward yourself for doing everything you can to succeed. After all, all work and no play is not fun.